Scheduling classes? Crazy. Professors? Crazy. Midterms? Don’t even get me started. COLLEGE. IS. CRAZY. But you know what else is crazy that we seem to overlook every time? Life. I can now look back at my childhood and say, “I guess my parents weren’t THAT crazy for making me eat those vegetables after all,” but in the moment, I honestly believed that the practice of eating vegetables was a conspiracy every parent in the world was in on, I thought there was no way something that tasted so nasty could be healthy for me. In retrospect, it just seems as though we’re never quite adjusted to everything that is going on in our lives. This is a commonality I think everyone shares even if they don’t realize it (or aren’t willing to admit it) at times. Hindsight and foresight are unique skills that only humans truly have (at least at the extent that we use them to regularly). This isn’t meant to be a depressing narrative at all, though! I’m not implying that, despite these traits, there’s no satisfaction or fulfillment to look forward to, but I think it’s safe to say hindsight and foresight can act as double-edged swords on a daily basis. Most would argue that foresight, our ability to plan or act based on mentally constructed “what if” situations, solely exists to aid our survival. Hindsight works in a similar way, where we can form mental hypotheticals, but instead for actions we DIDN’T take. The same example works here too: “If I HAD eaten mom’s chocolate chips, either A: I wouldn’t be here today or B: I would have suffered a great deal because of it, and I could never enjoy chocolate chips again because of the association with traumatic experience.” This reflection is important not only because we affirm to ourselves that we made the right choice, but because we can use that experience to further aid our use of foresight. Although comedic and seemingly insignificant at times, both foresight and hindsight are very necessary for experiencing satisfaction and fulfillment. However, like most things in life, they are also tools we can use to our own detriment. Using foresight to plan our life stories all at once can lead to a lot of self-conflict and stress just in figuring out exactly what our plan should be; worse yet, plans don’t always come to fruition, and it’s times like these that we can fall into a state of self-declared failure. Hindsight only makes this negative state worse because we dwell on those actions we regret, and it can supersede any thoughts of hope or forward thinking that actually leads to progress or response. Like anything else in life, managing hindsight and foresight to ensure they’re acting as tools of benefit in your life rather than working against you is a matter of finding a happy medium between moderation and excess. When you find yourself stressing too much about the future and what could happen, or you can’t stop dwelling on what you could have done better in the past, just re-center yourself and remember, foresight and hindsight are tools to be used in the present. If what you’re reflecting on can’t help you determine an action now, push it to the side and move on. Write it Down – Seriously! Anyone who knows me personally and reads this is sure to call me out as a hypocrite (and I certainly seem like I’m contradicting myself if you read my last post), but I am bringing this up because I genuinely desire the best for those of you reading this right now! Disclaimer: Even though I love baths as much as the next guy, this isn’t my goals list. HOWEVER, this is a great example of something you can make part of your daily routine to maintain focus and track progression towards your goals. In short, writing down goals, ideas, or even facts about oneself or a situation helps your brain form new connections between those ideas from a neurological standpoint (physical connections between neurons, etc. ), but it also helps organize the information from a psychological perspective as well. Logically, this idea of separation between ideas in order to clarify makes sense, because our brains are only capable of processing so much information at one time via conscious attention to stimuli. This means that even if you’re thinking about one goal, but there is more than a few factors contributing to your decision making, your brain isn’t capable of taking them all into account at once and you are likely to miss details, and missed details means missing out on successful grades, successful planning at work, or (if you’re a parent) possibly forgetting to bring your kids with you on the way to THEIR school event. Think back to the times you were having a conversation with two people at once; it was definitely manageable, and you at least understood the important parts of what each person was saying, but if you throw just one more conversation into the mix you get overloaded and don’t know what anyone is talking about. The same is true for performing multiple tasks, managing your time for different activities, and organizing ideas in your head. So what’s the secret to multi-tasking? Or as the researchers put it, rapid task-switching? Despite popular belief, the answer is not being a woman. However, one thing many women do that allows them to facilitate rapid task-switching so efficiently is- you guessed it- writing it down! This does not mean every task has to be explicitly written via pen and paper, but illustrating a web of ideas or a schedule for a day so you can process it both visually and cognitively allows your brain to process overlapping details it otherwise wouldn’t. And don’t hate me for citing the overly-referenced statistic… but YOU’RE 42% MORE LIKELY TO ACHIVE A GOAL IF YOU WRITE IT DOWN (according to a study done by a professor from Dominican University in California)! One statistic many of you might not know, however, is one procured from a study of graduate students in an MBA program at Harvard. Of the students involved in the study, 3% wrote down their goals and aspirations regularly, 13% had goals but had never written them down anywhere, and 84% didn’t have any established goals at all. The results were shocking: the 13% who had goals but didn’t write them down made 2x as much money as the 84% without goals, but the 3% of students who regularly wrote down goals and worked towards them made, on average, 10x as much money as the other 97% altogether. There was no confirmation or criteria regarding what percentage of students ended up achieving their goals, but obviously it worked out monetarily for the few who regularly wrote these goals down. I know that I discouraged planning everything down to the minute in a planner, and I stand by the notion that this causes more stress than it dissolves, but when it comes to goal setting, pursuing dreams, organizing ideas, or just simplifying concepts, writing them down and keeping your mind from wandering at all times is as good a way as any to make sure those dreams come true. Posted on October 29, 2018 Leave a comment on Write it Down – Seriously! Hey everyone, thanks for joining me again. 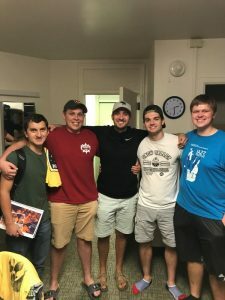 My name is Quinn O’Brien, and this is the 3rd entry in my blog! Last blog, I talked about defining your passion, managing stress, and really building your life around that passion rather than trying to fit it into the various other aspects of your life like school, work, and even relationships. One of the most important points I made is that passions are built off our core values, a passion isn’t something that you pursue because you deemed it your favorite, it’s actually part of you. I’m summing up my last post because it’s important to this week’s topic, which is a message about adapting. So what are we adapting to? Well, college life, obviously, but moreso, we’re trying to figure out how to thrive, not just survive in our first few weeks living as adults and managing the responsibilities that come along with that. Don’t get me wrong, though, the first few weeks of college, at least for me, were just a matter of keeping my head above the water. I had assignments come due that I didn’t even know existed, I procrastinated a lot of my first projects just because I didn’t exactly know how to get started, and frankly, I was just trying to get through each day. Attending lectures, figuring out where they were on campus, and then trying to balance student organizations and establishing a social life on top of it all was more than enough of a challenge. Now, all that can be stressful, but like I talked about last week, managing stress is mostly managing your perspective. But stress aside, we still have to DO things to be successful, or at least to accomplish our goals. If you aren’t stressed about the upcoming exam, great! But you still need to do studying to actually get through the class so you’re making progress towards whatever your career goal may be. And maintaining your social life. Part of the reason this concept is so hard to talk about is because the process of thriving is different for everyone, but luckily, the end result looks similar. For example, think of the different ways people study or prepare for a test! I’m the kind of person who likes to go to lecture, be 100% focused the entire time, and take all my notes during that time and then I do minimal studying outside of class. There are other people who instead might go to lecture, they sleep whole time, but hearing the professor-even in their sleep I guess- and then going home and copying notes off a power point works fine for them and they do just as well on the test as someone like me does if not better because they are dedicating twice the time to class. So since we’ve got a general idea of what thriving is, now let’s talk about some of the different ways we can get to that point. To experience the feeling of thriving, some people spend a lot of time during the day in their notebooks studying or rewriting things, and then they go to bed at a reasonable hour. Other people (me) go to class like I said, take notes there, spend the rest of the night hanging out with friends or doing something fun, THEN we stay up until midnight cramming a bunch of work that’s due in a few days, and then we realize we forgot to eat, so we go to Pancheros, Bdubs, or Hurts Donuts and hang out with friends to detox. As we can see, the process of thriving is very vague. We know the end result looks like, but it’s kind of hard to visualize a universal process that works for everyone. SO, I’m going to take a step back and refer again to the concept of adapting. In other words, making changes. Now some of you who are like my girlfriend who feel most comfortable to being prepared and having every part of the day planned and accounted for aren’t going to like what I’m about to say. Stop planning! Stop overpreparing for everything, experiment, try to see where you can cut corners, and then ADAPT. You’re probably doing well in class if you’re one of the planners, but if you’re still not, you need to understand that it’s probably other factors causing you to struggle in class, such as mental health or stress. Now the problem is these corners you can cut aren’t always obvious, and you’re just going to have to experiment and make some changes, whether that’s waiting till lecture to take notes instead of taking them beforehand to make time for, Netflix, food, or working out. Just try something different! I’m not just saying the planners have it wrong, though, because procrastinators and “go with the flow” students like myself also need to make changes. We can continue to look at ourselves and say, “oh, we’re ahead of the curve, we’ve already got a good perspective and stress isn’t an issue, I’m comfortable.” What that means to me, though, is that we need to make some changes, we need to get uncomfortable. Discomfort is where the greatest growth occurs. Don’t worry though, whenever you feel uncomfortable, that feeling isn’t going to be constantly hanging over you wherever you go. You’re still in control and can ease into the process and cope however necessary, whether that’s hanging out with friends a little more or just having an extra helping of ice cream in the cafeteria. So basically, what I’m trying to say is that the picture of thriving we’ve painted in society where comfort is success isn’t all it seems. The most fulfilled people, statistically speaking, are the ones who feel engaged, stretched, and in touch with their social life and relationships. Therefore, thriving really exists primarily in change and resulting growth, and that requires that we make ourselves uncomfortable. So try some of that out this week! If you’re normally a micromanaging school-a-holic, try waiting till class to take notes and spend a little extra time with friends or doing something you enjoy. And if you’re not doing enough studying, don’t be afraid to dedicate more time to schoolwork than you have in the past and see how it helps. No matter where you’re at in life, get a little uncomfortable, and experience a little growth. I promise, thriving is a worthwhile goal. College aside, I believe life is all about taking whatever comes your way in stride… and then experiencing falls, a LOT. What’s important though is when you trip, that you have the dignity to stand up, brush yourself off, and continue to be a positive light in everyone else’s day. Understandably, living out this lifestyle with a good attitude at all times seems impossible in college, as bumps in the road could affect your future career, prevent you from taking advantage of opportunities, and even long term relationships. These factors all contribute to one big stress cloud that is constantly looming overhead, and that stress can not only make schoolwork worse, but it can ruin the hobbies, activities, and friendships you love. Managing stress is important for every aspect of our lives, and for me personally, it holds even greater importance because I strive to be not only a carefree friend, but one who is always there to help the people around me in managing their own stress. In everything you do in life, whether it involves friendships, schooling, recreation, and ESPECIALLY your professional life, make sure it all aligns with your core beliefs. You’ve heard people say not to live split lives with different friends because it will literally tear you apart, but the same is true for everything else in life. When you aren’t devoting your life to a few basic goals, you’ll find that you start to delegate energy. Some of it will go to your family, some to your friends, your social life, a majority will go to work or your student occupation, and then little sliver of time left over (if any) goes to you and the hobbies you enjoy. As you can imagine and may already know from experience, this is a very taxing lifestyle and no matter how much progress you make in one aspect of your life, it simply won’t be able to make up for where you’ve fallen behind elsewhere. After I graduated high school, the idea of college, a future job, a family all became much more realistic than they’d ever been. Like most everyone else my age, I was experience the stress of transitioning to adulthood, and it really freaked me out. I knew what I SAID I was going to do at college and after the fact, but I didn’t REALLY know, nobody can actually predict the future. All throughout my junior and senior year, I’d planned on getting a job writing, but after an internship as a marketing editor the summer after graduation, I realized it wasn’t for me and I now had absolutely no idea what I was going to do with my life. So I was forced to take a step back and reevaluate my life goals; I thought I knew what I liked, and that was true, I LIKED my internship, but I had no clue what I LOVED. I was yet to find a passion. So I simplified it for myself: rather than try to figure out my life plan, I just decided to determine what I valued most in life, and how I can make that the focus of everything I did. You can be as successful as you want in every way imaginable, but if you don’t get a fulfillment out of life, you just won’t be happy. So instead of trying to build my life around some job I had never done like before, I committed to building my life around the things that made me happiest: friends, family, children, service, and at the root of it all, my faith. I’m a Christian, so I value loving other people, spending time building relationships, and serving. After I have acknowledged these values as the core of my person, THEN I start to choose the different ways I’ll spend my time on campus. Obviously this meant joining a Christian ministry as soon as I got on campus, so I joined Cru! Even if you don’t become best friends with the people in whatever student organization you join, just being around people who share a hobby or passion that you can use to get your mind off of schoolwork for a couple hours a week is immensely helpful. To keep family and friends from back home as a regular part of my life, I actually scheduled my classes so that I’m getting everything done Monday-Thursday, and I have Friday off. That way, I can take off for a three day weekend with family if I ever need to spend time with them. To make service a regular part of my weekly routine, I reached out to a daycare just off campus before I even moved in and asked if I could start volunteering a few hours out of the week working with preschoolers. I even managed to find a course that gave credit for volunteering in public and then relating the experience to philosophy in your own life and self-discovery. All those things are a huge part of me, but the question still remains: what am I going to do when I graduate? Heck, what degree am I going to graduate with? To be honest, I still don’t really know! At the moment, I’m a English and psychology double major, and I would love to work with children in the future in some way, but I am yet to figure that out. Rather than dwell on the fact that there are a lot of unknowns in my future, I’ve made my perspective one that focuses instead on how I can work towards finding that out, so I’m taking as much of a variety of classes as I can and dedicating my time to the things I already know I love. My parting words to you are this: if you are struggling with stress, anxiety, and the fear of not knowing that many of us share, redirect your energy towards what you DO know is important to you, and work wholeheartedly at using that experience to make you a better person not in terms of success, but in regards to fulfillment and happiness. Even after moving in on Sunday, the sensation of change hadn’t quite struck me yet. Despite being in a new place, meeting new people, doing new things, the experience wasn’t unlike something I had already done before, it was just like any other overnight event, a vacation, really. It wasn’t until Friday, the 17th of August, that I finally experienced my first day as a Hawkeye at the University of Iowa. It started out the same as the other days had, I silenced my alarm clock (that dreaded ringing that I know has caused serious trauma for many students like myself) on my phone for the 6th time, and I climbed out of my lofted bed. It was around 9:00, and my plans for the day were to meet up with my girlfriend and go shopping for groceries with my sister. I showered, got dressed, and made my way over to Catlett hall to meet them. Along the way, I took note of the number of students on campus that had seemingly quadrupled overnight (looking back now, I guess it techinically did since it was move-in week), and for some odd reason, I felt more at ease knowing that I wouldn’t be as alone as I thought being a freshman on campus. To be honest, I’m the type of person who is usually more introverted and tends to find security in a comfortable setting among familiar faces, but I do believe that in any period of adjustment, individuals like myself search for commonality to replace the familiarity that is now long gone seeing as how we moved into a new place. Anyways, I made my way to my OnIowa small group that was schedule for 2:30, and I walked into a classroom full of complete strangers with the exception of my roommate. In total, there was around 20-30 people in the classroom, so our leaders had us to icebreakers. As we quickly learned, the classroom wasn’t full of strangers at all, they were all freshmen who were living in the same building, and on the same floor as myself! The law of commonality held true, and we all got along and bonded right away. Long story short, I was able to make some great connections over the course of the next few hours; my classmates and I sat through a few lectures, and then we all walked back to our dorm to have dinner together. The greatest experience followed later that night. The highlight of the night- no, the highlight of the week- was Kickoff at Kinnick. Every single freshman attending the University of Iowa this fall came together at the stadium to celebrate the beginning of our new journey as classmates. The experience was very surreal, and what I expected to be just another novelty to tell friends and family I did in my first week became much more. Being together with ALL of my classmates in one place with so much history, tradition, and happiness was a surreal experience that I will cherish throughout the rest of my life. That memory is made even more precious knowing it was made alongside thousands of different people, yet in that moment, we were all Hawkeyes.